There’s an amazing coincidence that sometimes occurs in families — that is, your ancestor’s brothers and sisters typically have the same parents. So, if you can’t find your ancestor’s parents, try seeing what records his or her brothers and sisters left behind. You might be in for a big surprise! — it often leads to valuable information you otherwise would never find. As you research your family history, don’t forget to consider “collateral” relatives—i.e., your ancestor’s brothers and sisters, aunts and uncles, etc. While the information you can find on your direct ancestor may be sparse, you never know what kind of amazing family history treasures these “collateral” relatives may have left behind. “I was a quick convert to the principle of doing Collateral Research, or doing Whole-Family Research, as I prefer to call it, when my student found the obituary of Ann Oswald. Let me explain. “We’d worked on her family history and pretty well documented her Oswald line back to one Eleazer Oswald, of colonial Pennsylvania. This is a difficult surname to research, and we’d not found much on this elusive ancestor. “Eleazer apparently had married, for he had four children, but (of course) the wife’s name was unknown. The second son, James, was my student’s ancestor, and we had found a bit on him. Scanning the family group sheet she’d compiled, I asked how much work she’d done on James’ sibling. ‘None,’ was the answer, ‘they’re not my line.’ This was a Teaching Moment ready to happen, and I jumped right in. “To shorten this story, we began looking for any and all references to James Oswald’s siblings. My student really balked on one name, James’ sister Ann, for Ann had never married, so never had any children. ‘She died an old maid; what can we possibly learn from her records?’ said my student. Consider every person in the family. This means researching every sibling of your ancestor and their spouses. When an ancestor got old, they most likely went to live with a child or grandchild. That’s where you might find that missing gold nugget of information. Suppose you’re working on the Henry Sampson family in 19th century Virginia. You’re not having much luck. Then you realize the youngest Sampson daughter married into the Byrd family. So you check Byrd family histories and you find a Leander Byrd who married Lucy, the youngest daughter of Heinrick Sampson, who emigrated from Bavaria with his wife Anna Louisa Emch! Consider every person with the same surname in your ancestor’s locality during the time he was there. 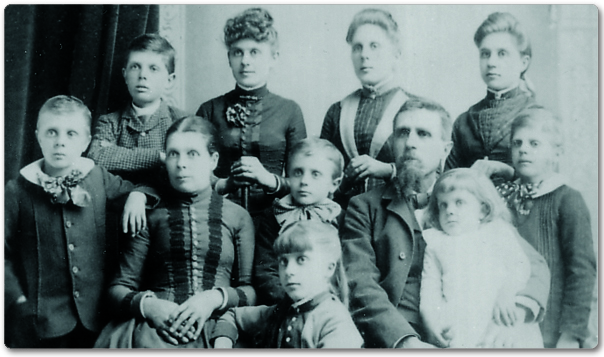 A study of the censuses, probates or church records might reveal your ancestor’s parents and siblings. Check the indexes to all wills, probates and land records for your ancestor’s surname in his county. It just might be that an unmarried nephew’s will leaves his estate to his cousins, children of his uncle (your ancestor), who was the son of the first settler in the county. The information on this page comes from an article titled “Doing Research On Collateral Lines—Why?” by Donna Potter Phillips, in Heritage Quest, Jul/Aug 2000, pages 52-53.